and even though it was last Tuesday and not today, pancakes are still good. 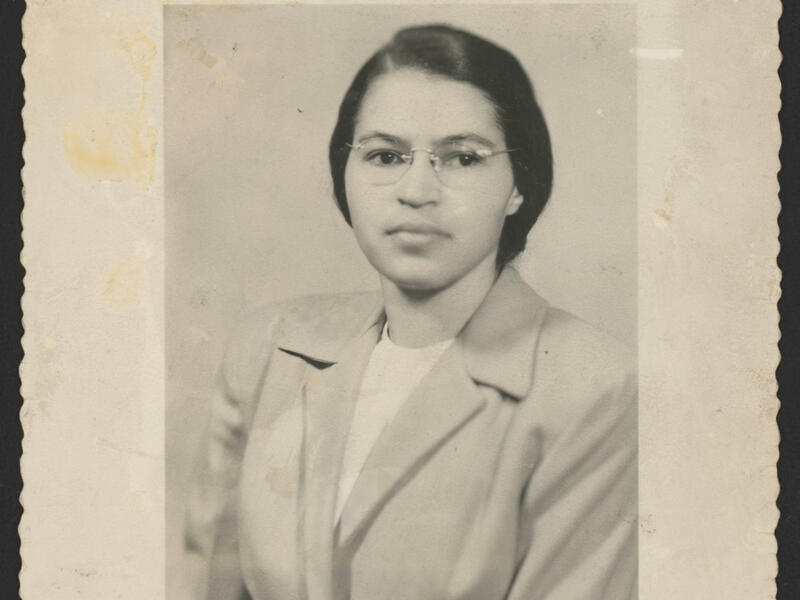 Another Kathleen told me that Rosa Parks had a pancake recipe in her papers, one for peanut butter pancakes no less. Check it out. 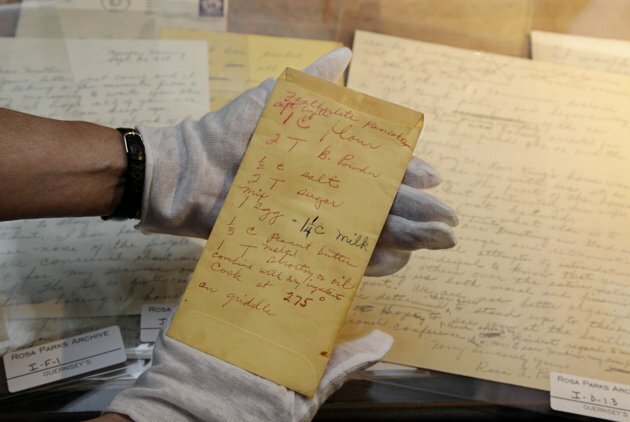 Notice the gloved hand of the curator going through the Rosa Parks paper. Notice also that the pancake recipe is on the back of an envelope. I’ve done that, too. Close up of the recipe….. 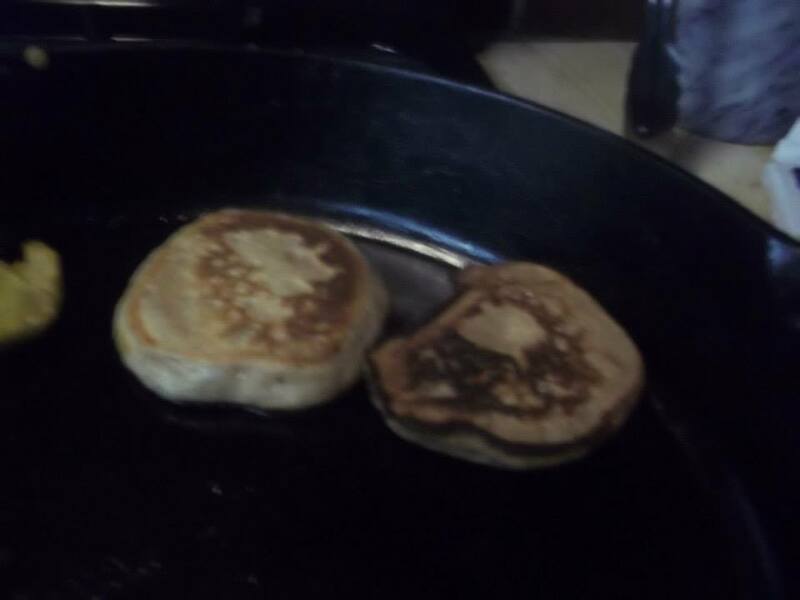 This is the batter – and I forgot baking powder – but they were still really, really GOOD. or the Ram or the Sheep. it’s all in how you translate it. Any way you do, it still deserves some celebrating. 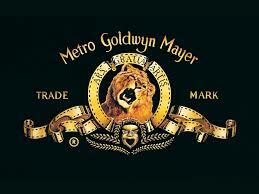 Lion’s head isn’t the actual head of a lion – just lion sized meatballs. Lion sized meatballs – no lions are harmed in making this dish! Put the meat in a large bowl. Mix together 1/3 cup soy sauce and the sherry, and ½ C cold water. Add 1 tsp of the sugar, salt, 1 Tbl of the cornstarch and mix well. Add this mixture to the meat. Using your hands, mix this all together well. Let this stand for at least 15 minutes. 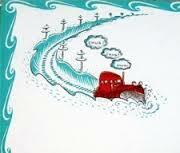 In a soup plate (or other deep plate) mix together 3 Tbl cornstarch and 2 Tbl of cold water to make a thin paste. Divide the meat into 8 portions (roughly tennis ball size). Form each portion into a ball with your hands. Heat the oil in a stir fry pan over medium heat. Coat the meatballs in the cornstarch paste, coating evenly. They will be sticky. 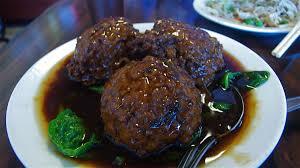 Brown the lightly coated meatballs in the hot oil for about 5 minutes or until browned evenly. Don’t crowd the pan. Handle the meatballs gently as they are very soft – Helen Chen uses 2 spatulas and gently loosens them from the pan when turning them. As they cook, transfer them to an ovenproof baking dish. Reserve the oil in the pan for the cabbage. When all the meatballs are browned and in the baking dish, combine the remaining 1 ½ Tbl soy sauce and 1 tsp sugar with ½ cup water and add it to the dish with the meatballs. Cover and simmer on low heat for 1 ½ -2 hours. I put them in a 350° oven and when they were good and bubbly, turned it down to 325°. Meatballs can be made up to this point ahead, and then re-heated. In the reserved pan, stir the cabbage in over medium-high heat about 5 minutes or until the cabbage is wilted. When the meatballs are cooked through, remove the meatballs from the baking dish with a slotted spoon. Skim the fat off the baking dish. Put the cabbage in the gravy, Put the meatball back on top of the cabbage. Recover and simmer for about 10 minutes more to heat everything through. Helen Chen’s Chinese Home Cooking. 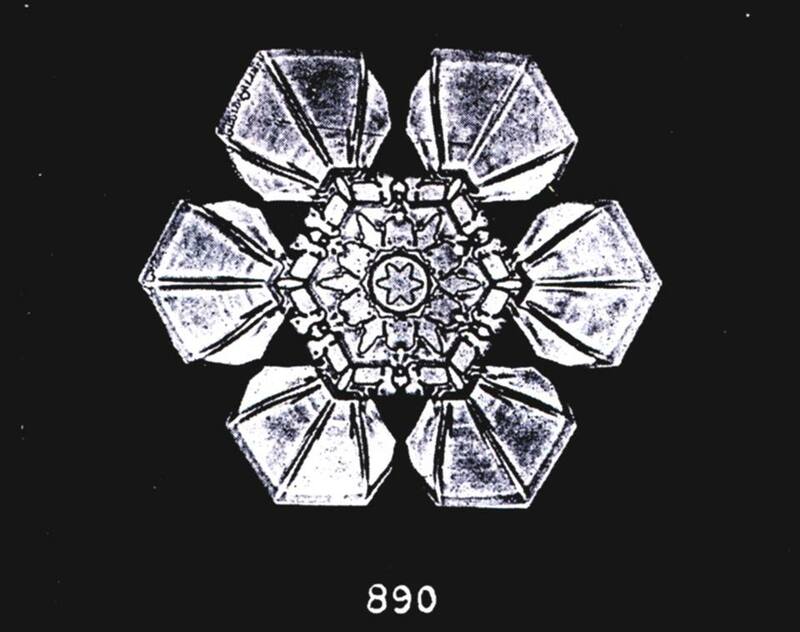 1994. pp.205-6. 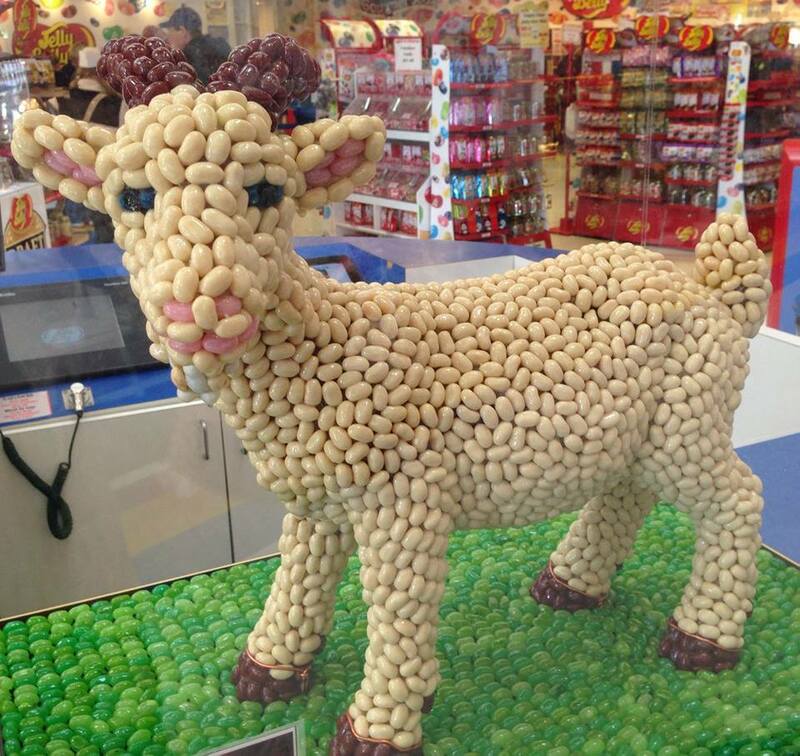 Jelly Belly Year of the Goat tribute – here’s to a sweet year ahead! 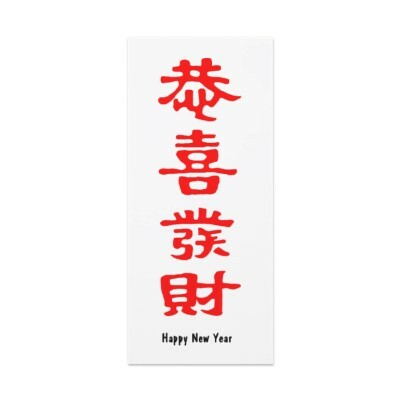 The New Years celebrations last 15 days – the first for this year was Thursday February 19th. One of my stated purposes of this blog (which I need to review from time to time because I’m easily distracted) is to form an outline of my culinary biography. 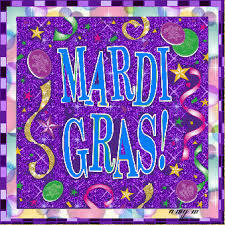 What are the foods and food occasions that I remember and shaped me ever so many different ways? My fascination and delight with cookbooks is part of my foodways story. 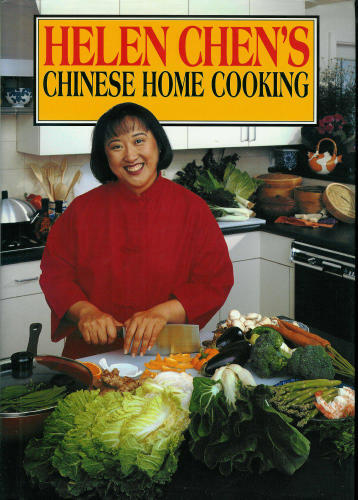 Because it’s the Chinese New Year, there’s one cookbook in particular that I associate with this time of year. I actually bought it September, according to my note in the flyleaf, and probably read it then. It’s been read several times since as well. I remember that I was going through Kingston Mall,(which properly was called something else, and is something else yet again now, but it’s proper alias is ‘Kingston Mall’ and eventually the people who make all the fancy signs and naming decisions will just name it what it is called) on my way from one place to another, and there was a display of books where there usually wasn’t a display of books. In my memory this was in , which I believe was never actually in Kingston…but it was also 1995….and the sticker on the book says “Provisions” which was a great little fancy kitchen shop. But in my memory there were large appliances and a basket of books where there were usually none. I would have sworn this basket was near dishwashers or washing machines….but probably not. The real point, and the one I can document, is that the books were already marked 1/2 off – Chinese Home Cooking was regularly $25 and a red line was drawn through that number and a $12.50 was written in by hand. 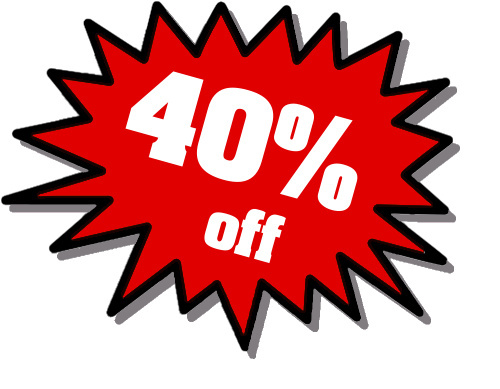 It all seems so quaint now…..and they were additional 40% off. I’m not good at math, but I even can figure out Under ten bucks at this time……and that put it right in my cheap thrills budget. Now Helen Chen happens to be Joyce Chen’s daughter…. 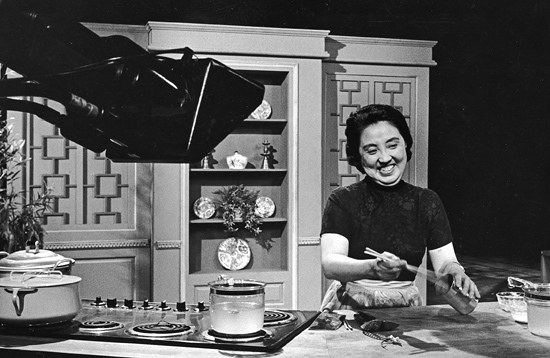 Joyce Chen from Channel 2, WGBH who had a cooking show Joyce Chen Cooks in the 1960’s. 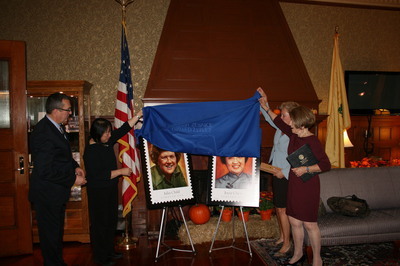 Ironically, although they shared studio space, the only image I could find of the two of them together was when their commemorative postage stamps were released in 2014. Here’s Joyce cooking up a storm. So my purchase, and my use, is part of my culinary biography. 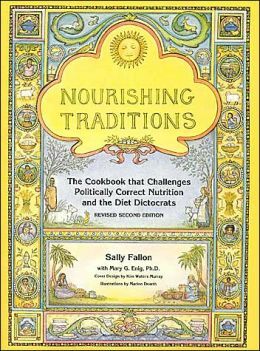 The book is also part of Helen Chen’s culinary biography. 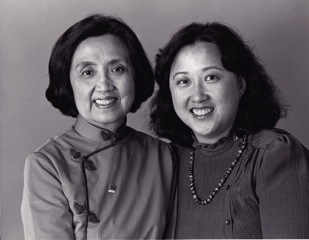 This book is lovingly dedicated to my mother, Joyce Chen. “….my mother used to talk to me about her wish that one day we would write a mother-daughter cookbook. As the weeks became months, and the months became years, our busy lives never brought us together in the kitchen to accomplish this collaboration. With the advance of my mother’s illness and dementia I thought that dream was gone forever. I was wrong. 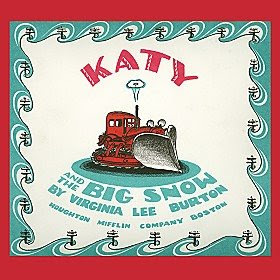 One morning I awoke with the realization that my book was the collaborative effort my mother wished for after all. Instead of having my mother beside me, I had her thoughts, her philosophy, her recipes, and her stories to guide me. ….I can’t recapture our past or change our destiny, but with my mother’s recipes I truly feel that she has actually been with me, leading me through the maze of her recollections, stories, traditions, experiences, and food that she once prepared. Once in a while I’d be working on a recipe and think of her so much I would have to drive over to the nursing home to be with her. Trim both ends of the radishes. Wash them well and drain well. Scrape away any discolored bits. Crush each radish with the broad side of a Chinese cleaver. If they’re large, cut them in half first. You want them crushed enough to soak up the dressing. Lacking a broadsided Chinese cleaver find something else handy (and clean) to thwack a mighty blow. A can-na something, a marble pestle, a handy rolling pin. More than a bruise, less than a buncha broken bits. 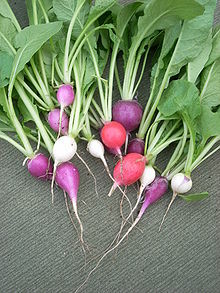 Crushed radishes into a bowl, sprinkle with the salt, toss….let them rest for 15 minutes. Then drain. Transfer to the serving dish. Mix the sugar and vinegar together in a small bowl (I actually use a small jar and shake it all up).Pour over the radishes, drizzle it all with the sesame oil and toss to blend. NOTES: I have used both dark sesame oil and light sesame oil depending on carefully I read the directions or the labels on the bottles – both are good. Also – a little hot sauce – and I’ve tried them all, my favorite is Rooster sauce – is hardly ever amiss. ½ teaspoon or to your taste. Helen also mentions that her mother would buy extra radishes that they would snack on with peanut butter….also very good; any sort of peanut dressing is also good on smashed radishes. Adapted from Helen Chen’s Chinese Home Cooking, p. 285. I hadn’t meant to take a break, but it snowed. So I shoveled. And shoveled. And shoveled some more. And then I was shoveled out. But I was too tired to write, so I slept. And while I slept, it snowed. More snow. and more shoveling.Snow. 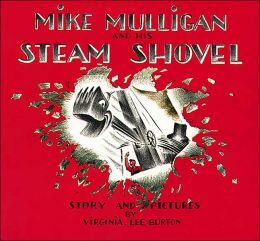 Shovel. 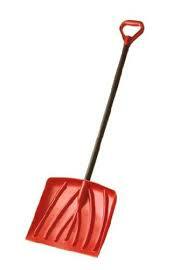 Snow Shovel. and then there was THUNDER-SNOW. This was very close to my house. And then it snow a little more. and all the trucks have flashing lights and back-up beeps and radios that squawk as they work all night long. Pancake Tuesday, soups, English Muffins, even meatballs….so much. But first a little more coffee. Going through the Recipe Box that Grandma B gave me, which included her meatloaf, lovely marvelous meatloaf. She says that you can easily half the recipe, but then you wouldn’t have meatloaf for sandwiches the next day. 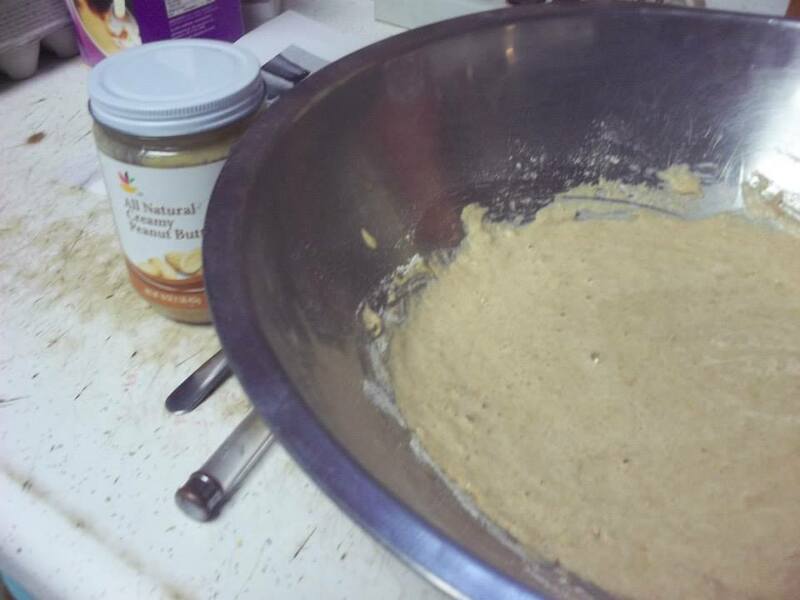 Mix 1st 6 (ingredients) and place in a baking dish or shape into a LOAF & place in roaster. Cover top with catsup – A THIN COAT. EASY TO Cut this recipe in half. 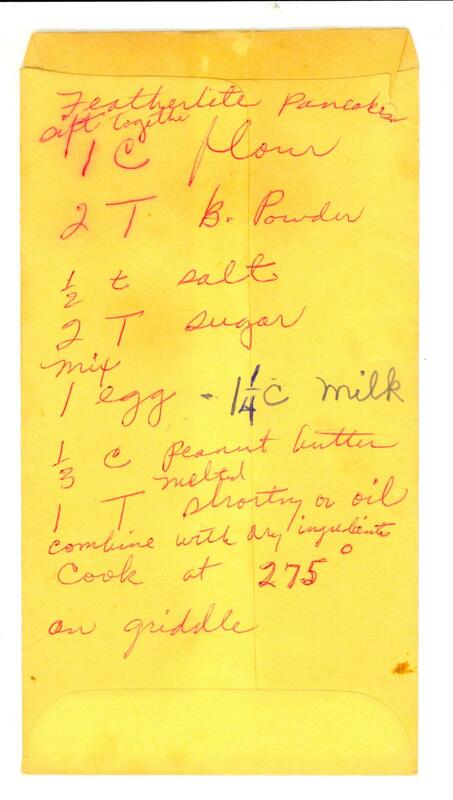 – A Grandma B Recipe Card – pretty much copied exactly the way she wrote it. Can you can hear the Nebraska? 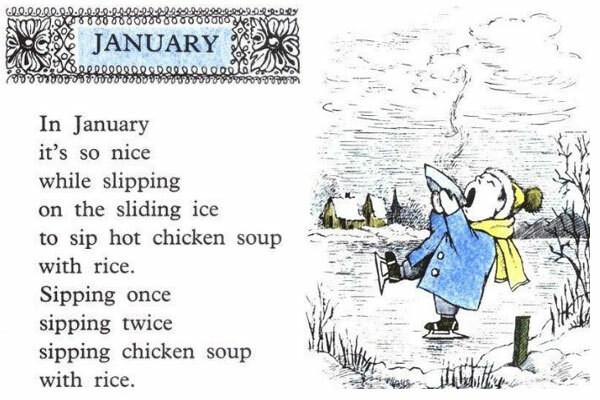 Chicken soup is also an easy (and cheap….I mean economical and low waste) way to have the same chicken twice. Feel free to eat as much of the meat as you’d like. First – you need chicken with bones in it. Don’t eat the bones – they’re the part that’s needed for making the broth. an onion – left whole, with maybe a clove or two in it. This could be a sad little excuse of an onion…. a lemon ….in short, look in the corners of the fridge and find the sad, the limp, the forlorn, the orphaned and rinse them and toss them in the slowcooker. Rinse off the vegetative matter and put in the bottom of the slow cooker. Pick the meat off the bone of the chicken and put aside. Don’t worry – you don’t have to be too careful about this. Put the bones, the leftover skin, any of the jelly in the pan on top of the vegetable bits. Add 3-4 Quarts water, until the slow cooker is full and everything is under water. Add the vinegar or wine – this helps get all the goodness out of the bones. Depending on how the chicken was cooked originally add some salt and or pepper now. Cover and let cook 6-8 hours. Uncover, cool, strain and voila! Broth. Makes about 2 Quarts broth. 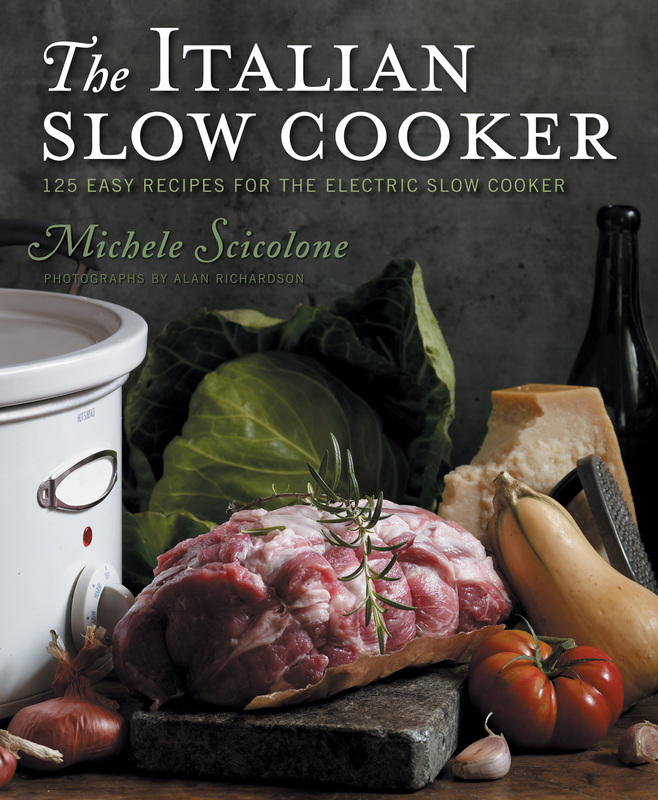 partly adapted from Italian Slow Cooker …. and years of lazy experience. Now, if you don’t have a slow cooker, you can use a heavy bottom soup pot, bring it to a boil and keep it at a low simmer again, 6, 7, 8 hours and then strain, season, use. Cook – until chicken is tender. You can add cut up carrots & celery. Add dumplings to boiling STOCK by teaspoon into soup. While dumplings cook – debone chicken to be returned to POT. Drop into soup by a teaspoon – cook until they are cooked through. 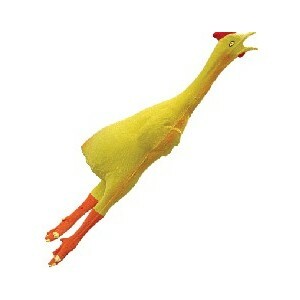 A rubber chicken just won’t do – but any combination of bony chicken parts will. This book was published in 2003, and I think it was fairly newly out when I was at the conference – which means it was over 10 years ago. How does time fly by like that? Still can’t make yoghurt.